Fully Adjustable for Lower Back Seating Support. Helps Prevent Back Problems. BackRest. Lumbar Support Cushion. Back Rest Pillow. for Just the Right Fit. See how AirFit™ Self-Inflating Technology works. 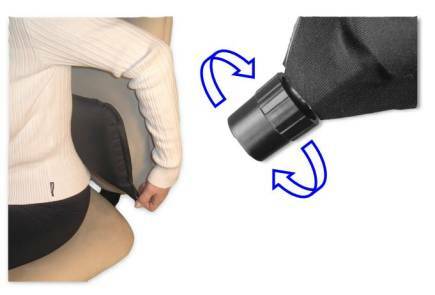 Provides improved lower back (lumbar) support when sitting. Fully adjustable for "custom" fit and personal comfort. Easy to use - patented twist valve controls level of firmness. Conforms to the unique shape of "your" spine for lower back pain relief. Contour shape fills the gap between the lower spine curve and the back of the chair.